Most of you will remember last year about this time. After the Christmas trees were taken down and presents were opened those of us whose hearts had been invaded by water were left feeling a little…empty. We wanted more, so did many of you. So we did the “300 voices” campaign. 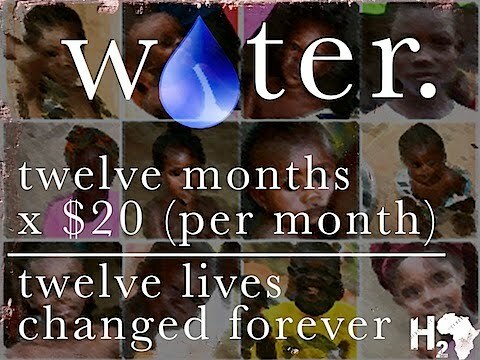 In the end it was just a fancy name for monthly giving towards water. We’re doing it again this year, but we’re calling it “12 People” instead because your monthly gift ($20, $40 or $100) will change at least 12 people’s lives. Tomorrow we’ll all come together and sign up here. You can do it any day you want, actually. I’m doing mine Friday because that’s when we get paid so if you have a similar excuse that’s fine! It will automatically deduct from your account every month once you sign up. You don’t like that option? Then make a one time donation of at least $240 ($20×12)here and become one of the voices. If you do the check payment, leave a comment or email me and let me know you’re in. This is kind of a big deal, you know. Just wait, in the coming weeks we’ll reveal the official total and it.will.blow.your.mind. Become part of the movement, because I can tell you with absolute certainty, you’ll never be the same. What a great idea- LOVE IT!